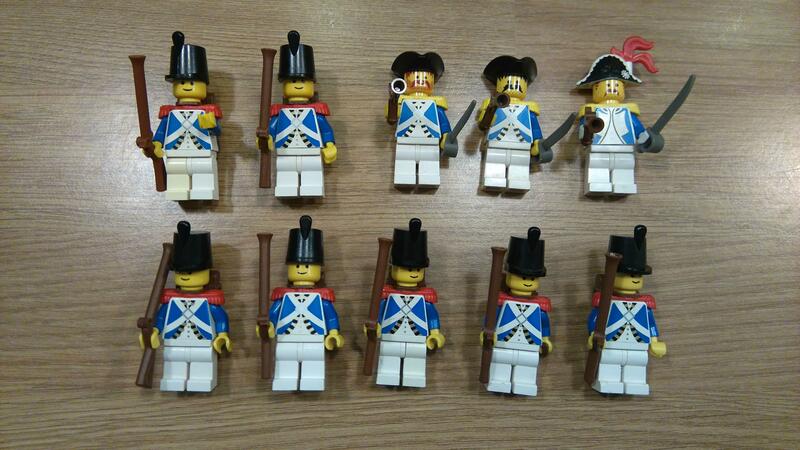 I have a large number of Classic pirates minifgures, blue and red soldiers and pirates. I thought of selling them in packs of about 12 for say £15 in either the red, blue or pirates. So for example in the blue pack you would get 1 imperial soldier governor, 2 imperial soldier officers and 9 imperial soldiers as they appear in #6276. I could post or bring to STEAM at the weekend if anyone's interested. I'll also post some pictures this evening. They're good condition, should be more clear from the photos later. I had a few hundred and picked out the best ones (as I didn't have quite as many shako's back packs etc. And yes with accessories, bicorne, tricorne or shako hats, epaulettes, back packs (for soldiers) and either swords, pistols or muskets. Here's example of a pack, but make that 10 figures not 12. 1 governor, pistol and sword. 2 officers, pistol and sword, 7 soldiers muskets and back packs. I think I have 8x blue sets, 8x red sets and 5 lots of pirates. Now sold 2 packs of blue and 1 pack of red. Still quite a few left though. Sold two more sets, still some left if anyone wants to grab some at Steam.